The Linksys EA6900 AC1900 Dual Band WiFi Router features dual wireless bands (2.4 GHz and 5 GHz) with data speeds up to N600 Mbps + AC1300 Mbps, great for media-intense applications such as video streaming and online gaming. Its four Gigabit Ethernet ports enable you to share data easily and quickly across Wi-Fi network, and to external devices - at speeds 10x faster than Fast Ethernet. You can use the high-performance USB 3.0 port to attach a storage device and quickly transfer large files or share devices across your Wi-Fi network. Plus, the USB 2.0 port is perfect for smaller file transfers or a dedicated printer. You can also harness this wireless router’s beamfoarming technology easily to help eliminate dead spots. Beamforming focuses the Wi-Fi signal directly to your smartphones, tablets, and laptops instead of sending out a general transmission. The result is a more efficient network with a wider range. 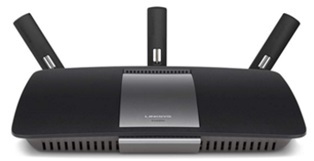 If you are interested, check out more about this Linksys EA6900 Smart Wi-Fi router here! Finally upgraded routers after years, this thing is outstanding! Hooked a usb 3.0 2tb external drive to it for network storage and all my devices access it easily and fast. The speed it transfers to and from it you'd think it was a local drive. The smart WiFi website that goes along with it is easy to use and does a lot. Great router for setting up an impressive home network with worry free internet access. I have about a 1300 sq ft rectangular shaped brick ranch and the router is pretty much in one of the corners. Not the best location I know but that's where the majority of my stuff is. But I have excellent WiFi signal on the whole floor, the whole basement, the garage which is attached to the basement but on the other side of a cinderblock wall, and it reaches an impressive distance around the yard and driveway. No problem at all to stream HD content via WiFi in the garage or anywhere in the house. I've seen most of the bad reviews here and elsewhere and while I don't doubt most users experiences mine have been great with this router. There was one firmware which made the router randomly disconnect, that was fixed with the last available firmware for this router dated May 2014. If you go to the Linksys support page you'll now see that almost all complaints have been satisfied. I'm pretty sure the May release will be the last firmware update for this router barring some kind of security concern. I wouldn't pay $200 for this router now given that many newer options are out there, but If any potential buyers can snag one for $150 or less I would go for it. It has great range, speed and has been rock solid with nary a disconnect or reboot since May. One piece of advice I will pass along to everyone regardless of which router one uses is to reserve IP addresses for everything that is regularly connected to your network wether wired or wireless. That will save many headaches down the road and eliminate probably 50% of peoples issues with routers in general. What a complete and total waste of money. I would have expected better quality from Linksys than this, particularly for $200. It drops constantly, and needs to be rebooted daily, sometimes multiple times. We are running two laptops (both about 40 feet away from the router), a Roku (which we unplug most of the time to try to lessen any activity going through the router), two iPhones, an iPad (off during the day), a Samsung Tab (off during the day) and a Canon printer. Seems like it should have been able to handle it - the 5g disappears completely from the wireless network most of the time. We're not streaming video - we both work from home and are typically only accessing Outlook, internet sites for research, and Yahoo mail. Very disappointed in Linksys - their phone support was no help at all - getting ready to purchase another router from a different vendor after not even six months of service. Replaced a Linksys E4200 that had the 2.4 channel die. It was easy to install and set up. Working well so far a month later. I am not a fan of the online set up but once done, I don't mess with it any more. The range is better than the E4200 and I am getting 5GHz a good 100ft away. On Comcast blast, I get 80M down within 15ft and at 100ft that drops to 15-20M which is expected but definitively better than the older unit allowing me to stream music at the far end of the yard. The signal is strong enough to maintain good throughput throughout my 2 story 2200sqft house including the basement. This router changed our lives....we can preset times the kids use internet and nice phone app makes it easy. Phone app only allows on/off feature for parental controls though, can't change times from phone. Return to top of "Linksys EA6900 AC1900 Dual Band Smart WiFi Router"! !